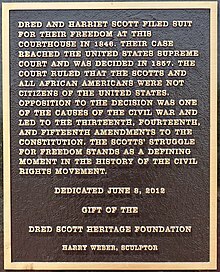 Dred Scott (c. 1799 – September 17, 1858) was an enslaved African American man in the United States who unsuccessfully sued for his freedom and that of his wife and their two daughters in the Dred Scott v. Sandford case of 1857, popularly known as the "Dred Scott case". 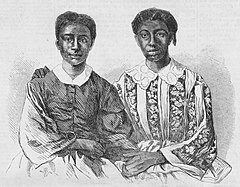 Scott claimed that he and his wife should be granted their freedom because they had lived in Illinois and the Wisconsin Territory for four years, where slavery was illegal. The United States Supreme Court decided 7–2 against Scott, finding that neither he nor any other person of African ancestry could claim citizenship in the United States, and therefore Scott could not bring suit in federal court under diversity of citizenship rules. Moreover, Scott's temporary residence outside Missouri did not bring about his emancipation under the Missouri Compromise, which the court ruled unconstitutional as it would "improperly deprive Scott's owner of his legal property". While Chief Justice Roger B. Taney had hoped to settle issues related to slavery and Congressional authority by this decision, it aroused public outrage, deepened sectional tensions between the northern and southern states, and hastened the eventual explosion of their differences into the American Civil War. President Abraham Lincoln's Emancipation Proclamation in 1863, and the post-Civil War Reconstruction Amendments—the Thirteenth, Fourteenth and Fifteenth amendments—nullified the decision. Dred Scott was born into slavery c. 1799 in Southampton County, Virginia. It is not clear whether Dred was his given name or a shortened form of Etheldred. In 1818, Peter Blow and his family took their six slaves to Alabama, where the family ran an unsuccessful farm in a location near Huntsville that is now occupied by Oakwood University. The Blows gave up farming in 1830 and moved to St. Louis, Missouri, where they ran a boarding house. Dred Scott was sold to Dr. John Emerson, a surgeon serving in the United States Army, who planned to move to Rock Island, Illinois. After Scott learned this, he attempted to run away. His decision to do so was spurred by a distaste he had previously developed for Emerson. Scott was temporarily successful in his escape as he, much like many other runaway slaves during this time period, "never tried to distance his pursuers, but dodged around among his fellow slaves as long as possible." Eventually, he was captured in the "Lucas Swamps" of Missouri and taken back. Blow died in 1832, and historians debate whether Scott was sold to Emerson before or after Blow's death. Some believe that Scott was sold in 1831, while others point to a number of slaves in Blow's estate who were sold to Emerson after Blow's death, including one with a name given as Sam, who may be the same person as Scott. As an army officer, Emerson moved frequently, taking Scott with him to each new army posting. In 1836, Emerson and Scott went to Fort Armstrong, in the free state of Illinois. 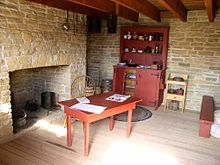 In 1837, Emerson took Scott to Fort Snelling, in what is now the state of Minnesota and was then in the free territory of Wisconsin. There, Scott met and married Harriet Robinson, a slave owned by Lawrence Taliaferro. The marriage was formalized in a civil ceremony presided over by Taliaferro, who was a justice of the peace. Since slave marriages had no legal sanction, supporters of Scott would later point to this ceremony as evidence that Scott was being treated as a free man. Nevertheless, Taliaferro transferred Harriet to Emerson, who treated the Scotts as his slaves. The case centered on Dred and Harriet Scott (top) and their children, Eliza and Lizzie. Back in 1846, having failed to purchase his freedom, Scott filed legal suit in St. Louis Circuit Court. Scott stood on solid legal ground, because Missouri precedent dating back to 1824 had held that slaves freed through prolonged residence in a free state would remain free when taken back to Missouri. The doctrine was known as "Once free, always free". Scott and his wife had resided for two years in free states and free territories, and his eldest daughter had been born on the Mississippi River, between a free state and a free territory. Any person descended from Africans, whether slave or free, is not a citizen of the United States, according to the U.S. Constitution. The Scott decision increased tensions between pro-slavery and anti-slavery factions in both North and South, further pushing the country towards the brink of civil war. Ultimately after the Civil War, the 14th Amendment to the Constitution settled the issue of Black citizenship via Section 1 of that Amendment: "All persons born or naturalized in the United States, and subject to the jurisdiction thereof, are citizens of the United States and of the State wherein they reside ..."
Plaque on Dred Scott case outside the Old Courthouse, St. Louis, MO. May 9, 2012, Scott was inducted into the Hall of Famous Missourians; a bronze bust by sculptor E. Spencer Schubert is displayed in the Missouri State Capitol Building. March 6, 2017 — the 160th Anniversary of the Dred Scott Decision — on the steps of the Maryland State House next to a statue of Supreme Court Chief Justice Roger Taney, his great-great grand nephew Charlie Taney apologized on his behalf to Scott's great-great granddaughter Lynne Jackson and all African-Americans "for the terrible injustice of the Dred Scott decision." During the ceremony, Kate Taney Billingsley, Charlie Taney's daughter, read lines regarding the court's decision from the play "A Man of His Time". ^ VanderVelde, Lea (January 20, 2009). Mrs. Dred Scott: A Life on Slavery's Frontier. Oxford University Press, USA. ISBN 9780199710645. ^ "Dred Scott, And Oakwood University • Deep Fried Kudzu". Deepfriedkudzu.com. February 22, 2011. Retrieved July 9, 2018. 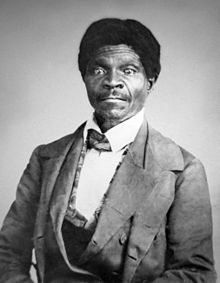 ^ "A catalyst for Civil War after suing for freedom, slave Dred Scott once lived in Huntsville". Blog.al.com. Retrieved July 9, 2018. ^ a b c d e f "Dred Scott Case, 1846-1857". Missouri Digital Heritage. Retrieved July 16, 2015. ^ "U-M Weblogin". Search.proquest.com. Retrieved March 16, 2017. ^ Johnson, George D. (January 17, 2011). "Life". Profiles In Hue. Xlibris Corporation. pp. 34–6. ISBN 978-1-4568-5120-0. ^ Finkelman, Paul (2007). "Scott v. Sandford: The Court's Most Dreadful Case and How it Changed History" (PDF). Chicago-Kent Law Review. 82 (3): 3–48. ^ "Multimedia | The Gilder Lehrman Institute of American History". Gilderlehrman.org. Retrieved March 16, 2017. ^ Scott v. Emerson, 15 Mo. 576, 586 (Mo. 1852) Archived December 13, 2013, at the Wayback Machine Retrieved August 20, 2012. The Emersons were represented by Hugh A. Garland and Lyman D. Norris. ^ Randall, J. G., and David Donald. A House Divided. The Civil War and Reconstruction. 2nd ed. Boston: D.C. Heath and Company, 1961, pp. 107–114. ^ Frederic D. Schwarz Archived 2008-12-03 at the Wayback Machine "The Dred Scott Decision", American Heritage, February/March 2007. ^ Carey, Patrick W. (April 2002). "Political Atheism: Dred Scott, Roger Brooke Taney, and Orestes A. Brownson". The Catholic Historical Review. The Catholic University of America Press. 88 (2): 207–229. doi:10.1353/cat.2002.0072. ISSN 1534-0708. ^ a b Ehrlich, Walter (September 1968). "Was the Dred Scott Case Valid?". The Journal of American History: 256–265. JSTOR 1899556. ^ a b Hardy, David T. (2012). "Dred Scott, John San(d)ford, and the Case for Collusion" (PDF). Northern Kentucky Law Review. 41 (1). Archived from the original (PDF) on October 10, 2015. ^ "Harriet Robinson Scott - Historic Missourians - The State Historical Society of Missouri". shsmo.org. ^ a b O'Neil, Time (March 6, 2007). "Dred Scott: Heirs to History" (PDF). St. Louis Post-Dispatch. Archived from the original (PDF) on July 28, 2011. Retrieved May 26, 2011. ^ a b c d e f g h i Arenson, Adam (2014). "Dred Scott versus the Dred Scott Case: The History and Memory of a Signal Moment in American Slavery, 1857–2007". In Konig, David Thomas; Finkelman, Paul; Bracey, Christopher Alan (eds.). The Dred Scott Case: Historical and Contemporary Perspectives on Race and Law. Ohio University Press. pp. 25–46. ISBN 978-0-8214-4328-6. ^ Griffin, Marshall. "Dred Scott inducted to Hall of Famous Missourians". Retrieved March 16, 2017. ^ 314-340-8349, Madeline O'Leary • moleary@post-dispatch.com >. "Dred and Harriet Scott statue ready for debut". stltoday.com. Retrieved March 16, 2017. ^ "From a descendant of Roger Taney to a descendant of Dred Scott: I'm sorry". Washington Post. Retrieved March 7, 2017. ^ Billingsley, Kate T. (March 2, 2017). "Historic Healing & Reconciliation 160th Annversary Of Dred Scott Decision Monday March 6, 2017". Kate Taney Billingsley. Retrieved March 7, 2017. ^ "Three 6 Mafia – Spill My Blood". Genius.com. Retrieved July 9, 2018. ^ "Rage Against the Machine – Voice of the Voiceless". Genius.com. Retrieved July 9, 2018. ^ "Little Brother – Speed". Genius.com. Retrieved July 9, 2018. "Scott, Dred" . Appletons' Cyclopædia of American Biography. 1900.